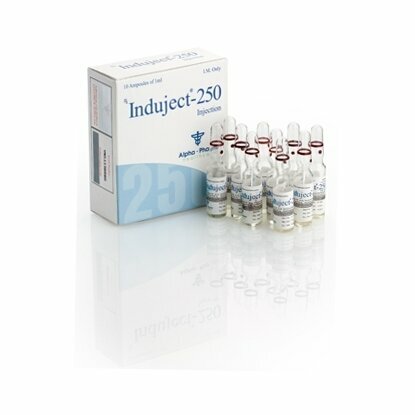 Induject-250 is a very popular steroid that is used by bodybuilders. Because of this composition it has some positive qualities that are very interesting for athletes. Sustanon has a better has a better effect than Testosterone Enanthate, Cypionate and Propionate if used separately. The strong effect of the active chemicals Induject-250 persists up to 3-4 weeks. This drug is good to be used to increase strength and increase muscle mass. Comparing to Testosterone Cypionate and Enanthate, Induject-250 has less water retention. 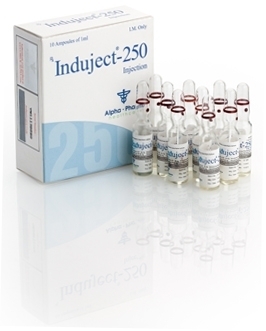 Induject-250 is administrated once a week intervals between injections may be up to 10 days. The dose for bodybuilders and heavy athletes starts from 250 mg every 14 days and gets to 1000 mg per week. In most cases, 500 mg per week is sufficiently and the dosage may be reduced to 250 mg per week if it is combined with another steroid. For a faster increase in muscle volume, Induject-250 can be mixed with Nandrolona D or Anapolon, which stimulate the sharp rise in the muscles. Side effects of Induject-250 are similar to Testosterone Enanthate. The side effects are more androgenic type (aggressiveness, acne, sexual simulation, pattern baldness), which appear only if overdosage.